The use of a trial is a wonderful theatrical trick to tell a story. It can captivate an audience, provides a ready conflict, and inherently builds to a conclusion. Examples abound: A Few Good Men, The Caine Mutiny Trial, The Last Days of Judas Iscariot, … the list goes on an on. 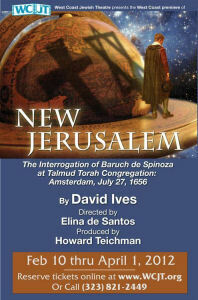 I mention this because a number of weeks ago I was captivated by a play broadcast by LA Theatre Works: New Jerusalem: The Interrogation of Baruch de Spinosa at Talmud Torah Congregation: Amsterdam, July 27, 1656. That production, starring Edward Asner, Richard Easton, and Matthew Wolf, was captivating. So when I discovered that the West Coast Jewish Theatre was doing a the first full-staged version on the west coast at the Pico Playhouse, I went out and got tickets for last night. New Jerusalem is a dramatization of the “trial” of Baruch Spinoza, a Jewish philosopher whose positions are controversial even today (we had numerous discussions on the subject on the Liberal Judaism Mailing List). The known facts are this: Baruch de Spinoza, a member of the Portuguese Jewish community living in exile in Amsterdam was summoned to Talmud Torah on Tuesday, July 27, 1656. We do know that he was later excommunicated from that community by Rabbi Saul Mortera. We have the words of the excommunication writ and Spinoza’s response. We know the characters in Spinoza’s life and his philosophy. Beyond that, we have no idea what happened when he was interrogated. So playwright David Ives crafted the artifice of a trial to present the conflict and Spinoza’s philosphy, beginning with the historical summons, and concluding with the actual writ of cherem and Spinoza’s response. It is a wordy play (as trials are) without a lot of action. Ives also introduces historical anachronisms into the staging and the language which some find jarring and others find distracting. Personally, I found I noticed them more on stage than on the radio. Still, the story and the philosophy are compelling, and make for an evening of intellectual stimulation. You can find a good summary in the Santa Monica Mirror review. The story does highlight the precariousness of the Jewish community: even in locales where life is seemingly good, there are often accommodations made and the situation not entirely stable. This was true for the longest time throughout history, and does explain why Jews are so sensitive to the need to preserve religious freedom in the US and the Jewish state in Israel. In preparing this write-up, I came across two reviews of New Jerusalem: one from the LA Times and one from Stage and Cinema. Both found the story a bit artificial (which it was, as I noted above) and had problems with the actors. I had no such problems; perhaps the actors have grown into their roles since opening night; perhaps things were improved by the new prosecutor (the casting for this role changed during the run). There were still a few line problems, but that happens in small theatre where the role is not the day job of the actors. So let’s get to the acting team. Prosecuting the case for the Dutch government was Abraham van Valkenburgh, played by Tony Pasqualini. Pasqualini did a good job with the role (although I didn’t like his costuming). The leaders of the congregation were Rabbi Saul Levi Mortera (portrayed by Richard Fancy) and Parnas Gaspar Rodrigues Ben Israel (portrayed by Shelly Kurtz). Of the two, I really likes Kurtz’s performance. He came across as real–perhaps this was due to the fact he was a Yeshiva University graduate. Kurtz’s Ben Israel came across as a man who wanted to learn; a leader of his congregation who cared about the community and wanted to do the right thing to protect it, but didn’t want to cast any member out unless he had to. Fancy was reasonable as Mortera: he had the emotion and fire for the most part, but an indescribable something was missing. Here was a man whose entire theology was being beaten down and the survival of his community was threatened: there needed to be more hurt and pain (there was also the issue that there was something wrong with his beard that made made the real beard seem to look fake). Baruch de Spinoza — perhaps the most important role — was portrayed by Marco Naggar. Naggar had the passion for the role, although he came across as too contemporary (perhaps it was the lack of a beard, which he should have had as part of an Orthodox community). His performance was quite good, and you got the impression that he really believed the philosophy. In supporting roles were the various friends and relatives of Spinoza. Simon de Vries, portrayed by Todd Cattell, was perhaps a little older for the role (when contrasted to Naggar), but performed it well. de Vries is the flatmate of Spinoza who ultimately provided the evidence of his philosophy. As Clara van den Enden, the Christian daughter of his Deist landlord, Kate Huffman was wonderful. Perky and spirited, you can see why Spinoza loved her. Lastly, as Spinoza’s sister Rebekah de Spinoza, Brenda Davidson came across a bit shrewish (but I believe that was her character). In real life, it was Rebekah that initiated the trial out of an inheritence dispute. The production was directed by Elina de Santos, who made some staging decisions that (in my opinion) hurt the program. She chose to have the actors be in a mix of modern dress (shiny suits for Van Valkenburgh, modern jeans for deVries, and a light airy dress for van den Enden), sedate suits (Mortera and Ben Israel), and somewhat period dress for Rebekah de Spinoza. It didn’t work, was distracting, and didn’t convey the intent of the story being applicable to modern times. I would have preferred if all the characters were in a somewhat period dress. That would have enabled me to focus on the story, as opposed to being distracted by the dress. The audience is smart enough, even in a period piece, to see the applicability to today. Perhaps Stephanie Kerley Schwartz, who did the costumes, should have spoken up more. Schwartz‘s set design, however, was good: a flexible space that served as a good bimah for the trial. The lighting by Leigh Allen was good — I particularly liked the lighting of the windows. The sound, by Bill Froggatt, was effective and not distracting, although it was clear the shofar was a recording. Priscilla Miranda was the stage manager. Tara Windley was assistant director. New Jerusalem was produced by Howard Teichman, the artistic directory of WCJT, assisted by Diane Alayne Baker. New Jerusalem continues at the West Coast Jewish Theatre through April 1. Tickets are available online; discount tickets may be available via Goldstar. The remainder of the WCJT season is the musical “The Immigrant” (book by Mark Harelik, lyrics by Sarah Knapp, music by Steven M. Alper), opening May 18, 2012, and “Mickey’s Home” by Stephen Fife, opening September 28, 2012. Upcoming Theatre, Concerts, and Dance: Next week brings two productions: “American Idiot” at the Ahmanson, and “Journey’s End” at REP East. March will conclude with Tom Paxton in concert at McCabes on 3/31. April will bring “Billy Elliot” at the Pantages, the Southern California Renaissance Faire, “Once Upon a Mattress” at Cabrillo, and “Dames at Sea” at the Colony. It may also bring the new production of “Working” at The Production Company in Hollywood (haven’t seen the show in years, opens 3/16); the new small-theatre production of “Spring Awakening” by Over The Moon Productions at the Arena Stage (curious to see this in a small production, runs 3/14-4/22); and possibly “The Heiress” at the Pasadena Playhouse (heard it on LA Theatre Works and it sounds good). May will bring “The Great American Trailer Park Musical” at REP East, the senior dance show at Van Nuys HS, and may bring “Follies” at the Ahmanson, and the Spring Railfestival at Orange Empire Railway Museum. It also brings my daughter’s HS graduation. As always, open dates are subject to be filled in with productions that have yet to appear on the RADAR of Goldstar or LA Stage Alliance.